OpenTable diners named Enzo’s on the Lake one of the 100 Most Romantic Restaurants in America for 2018! Call 407.834.9872 or book online with OpenTable. Ask about the special dishes our Chef prepares every evening. Variety of house specialties prepared daily by our chef. Fresh mussels in the shell opened in the broth of tomatoes, olive oil, garlic and red pepper, served with garlic flavored Tuscan bread. Thinly sliced filet mignon topped with olive and fine shavings of parmesan. Homemade meatballs in sugo di vitello topped with parmigianno. A variety of baby greens served with house dressing. Sliced tomatoes, fresh mozzarella & basil drizzled with extra virgin olive oil. Homemade fettucine with lobster and shrimp in a light saffron and green onion sauce. Fresh clams opened in the shell in a broth of crushed tomatoes, olive oil, garlic and red pepper. Homemade pasta sautéed with shitake mushrooms and arugula. Homemade ravioli stuffed with ricotta, chicken and spinach. Served with a delicate tomato sauce. A classic Roman spaghetti tossed in a skillet with sautéed onions, bacon, farm fresh egg yolk, black pepper and Romano cheese. Served in the skillet. Thick, hollow pasta with a robust sauce of prosciutto, peas, bacon, mushrooms and parmesan. Short hollow pasta in a puree of tomato cream marinated red pepper vodka sauce. Fresh Dover Sole sautéed in olive oil and lemon. Grilled jumbo shrimp served open faced and topped with a sweet pepper and garlic vinaigrette, accompanied by a smoked mozzarella risotto dome. Chef's daily fresh fish selection. Italian Bouillabaisse - Mussels, jumbo shrimp, clams, fresh fish and Maine lobster in a light tomato broth. Aged Tenderloin grilled and topped with a Parmigiano Reggiano herb crisp, finished with a 12 year old balsamic vinegar. Served with rosemary potatoes and broccolini. Thinly sliced Black Angus aged beef with shitake mushrooms, arugula and 12 year old balsamic vinegar. Grilled Australian lamb chops marinated in a sauce of extra virgin olive oil, garlic, fresh oregano and lemon. Served with a creamy polenta and baby arugula salad. Slow braised in chianti ragu. Served over fresh homemade pappardelle garnished with peas. Veal Scalopine sautéed in extra virgin olive oil with a peppadew, prosciutto, garlic and Pinot Grigio sauce. Served with peas. Herb roasted all natural airline chicken breast basted in a sauce of Chardonnay and lemon. Served with rosemary potatoes and broccolini. We do not offer separate checks for parties of 9 or more. *Undercooked meats, poultry, seafood, shellfish or eggs may increase the risk of food borne illness. From our outdoor sculpture garden and lakeside gazebo to our myriad private dining areas and event spaces we offer a variety of ways for you to celebrate or commemorate any event. If you’re interested in booking a private event please contact our Special Events Coordinator, Susan Nunez, at (321) 262-1623. Susan can also assist with buyouts and partial buyouts of the entire restaurant for private functions. 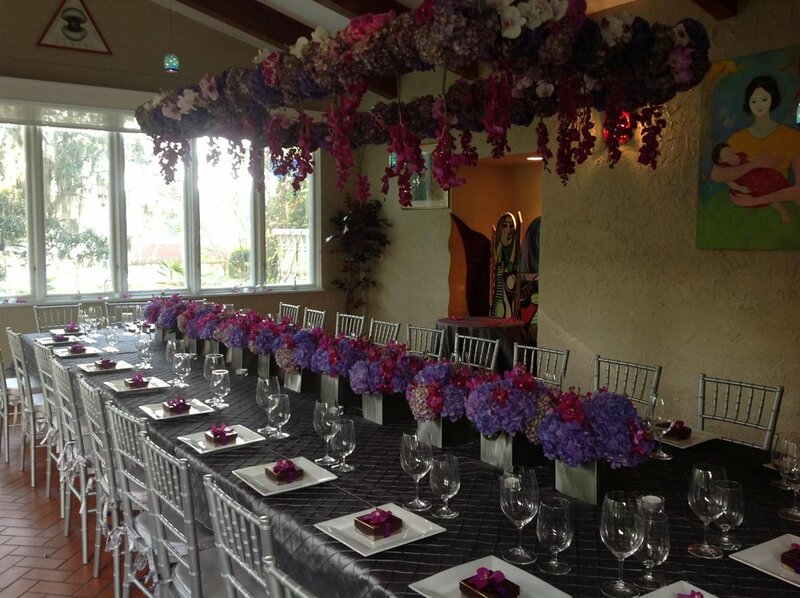 Our in-house florist is Kelly Shannon Floral in Orlando, FL. Enzo’s on the Lake is open Tuesday - Thursday for dinner from 6pm-10pm. We seat guests on Friday and Saturday from 5:30pm to 10pm. On Friday’s we open for lunch from 11:30am-2pm. We can accommodate private events outside normal hours of operation. We look forward to speaking with you! The Main Dining Room is available on days the restaurant is closed (Sunday and Monday) and can be combined with the Florida Room, the Fireplace Room and La Terrazza for large parties and weddings. Il Dolce Angolo, or “The Sweet Corner,” can accommodate up to 40 guests. This room is often used for business meetings, receptions, holiday parties and birthday celebrations. The room can accommodate a conference style table for 22. This lovely room overlooks our sculpture gardens and Lake Fairy. It is separated from our main dining room by the European bar. La Terrazza seats 50 guests comfortably and is perfect for a wide variety of private functions. This room seats up to 24 guests and is used for smaller events. We can seat up to 16 guests at one table. 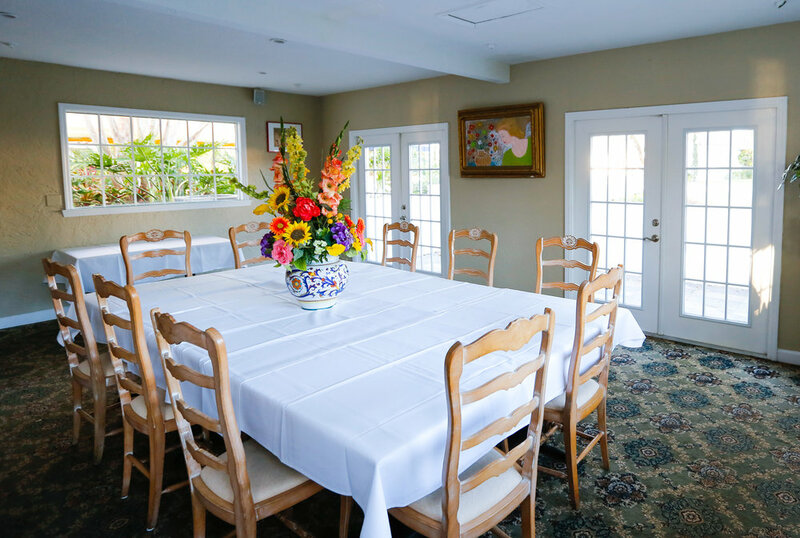 The Florida Room is adjacent to our main dining room and may be use for smaller parties or combined with the main dining room to accomodate larger parties. Enjoy our sunset views for corporate or wedding events. Located in Orlando, Enzo's on the Lake is a purveyor of fine Italian dining. Enzo’s on the Lake started as a home and has continued to be one. In 1980 Enzo Perlini wanted to create a restaurant in Orlando where a Roman would feel at home. He wanted his new home to reflect the flavors, colors, and vibrancy of his city-- and that is Enzo’s. Everything we do at Enzo’s is in service to that mission: our family recipes passed down from Nonna Maria-- a blending of Roman and Neapolitan kitchens-- Enzo’s innovative creations, traditional Roman flavors, and family art decorating the walls. Elaine Ross, Jo Anne’s mother, painted almost all of the paintings that adorn the walls-- so from our family to yours, we give you Enzo’s. Enzo and Jo Anne have always been committed to Enzo’s original vision: family owned and crafted with love. We are a family and what we make here is exactly that. We make pasta from scratch by hand in a pasta maker from Italy. We buy fresh fish. We are deliberate in preserving our flavors and tradition, but love to try new things as we grow. After almost 40 years we are still here because of our attention to detail. We are still here because we don’t take shortcuts. Our building and property used to be a private residence and when Enzo and Jo Anne purchased the property in 1980 they converted it to a restaurant. They purchased the property from the original owners who built the Italian style villa on the lake in 1955. Room by room Enzo and Jo Anne transformed the house into a restaurant; a garage became a kitchen, a bedroom became “Il Pensatoio,” or “The Thinking Room,” our old school bar. The Perlini children grew up here and the staff, many of whom have worked here for decades, are our family-- their hard work, their attention to detail, and their care for our customers have made Enzo’s what it is, and has been for almost 40 years. We can’t wait for you to join us and become part of our family tradition. One of Jo Anne’s favorite memories is of Josh, the youngest son, eating our homemade meatballs on the back counter at three years old, mouth full, and one meatball in each hand-- incidentally, Josh still holds the record for the number of ravioli eaten in one sitting at a whopping 22 ravioli.. Once you try them you might be tempted to challenge him! Our longtime customer and friend, Robert Earl, host of The Cooking Channel's "Be My Guest" stopped by Enzo's on the Lake to film a segment for his show. We're conveniently located 20 minutes from downtown Orlando and 35 minutes from major attractions. Help us direct your email. Thank you! Enzo's on the Lake will contact you shortly.